With all due respect to author George Santayana, who said, ” Those who cannot remember the past, are condemned to repeat it,” I disagree with you, sir. Eric Burdon, former lead singer of one of the British Invasion’s Holy Trinity, The Animals, does remember the past and does repeat it on a nightly basis. Does Burdon condemn it? Hell no! I know Santayana meant it in a totally different way but Burdon does the opposite of condemning his past by paying tribute to the heroes of his youth from the very first recordings that he did with The Animals to the present day on his latest album, Til Your Water Runs Dry. He also conveyed deep admiration and respect to the blues and his early rock ‘n’ roll heroes, most notably Bo Diddley, as I witnessed at his concert a few weeks ago at the Saban Theatre in Beverly Hills. At age 72 and as full of piss and vinegar as ever, the Rock ‘n’ Roll Hall of Famer belted out new material from his aforementioned Til Your Water Runs Dry album at the Saban with as much passion and attention as classic Animals and War songs in the set. 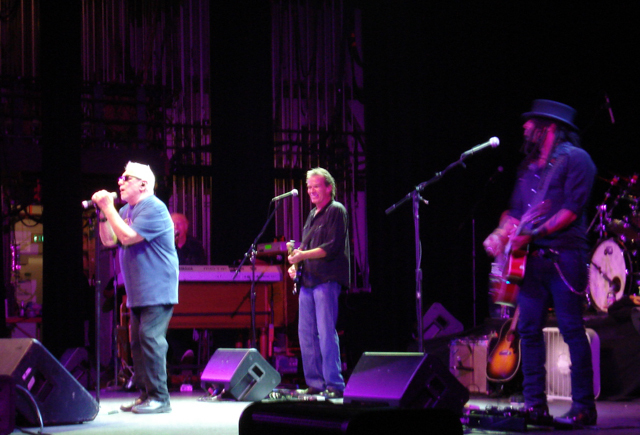 With bright white hair and wearing pitch-black shades, Burdon and his band of musicians, featuring guitar hero Eric McFadden, began the set with Eric Burdon and The Animals’ 1967 psychedelic chestnut, “When I Was Young”. The singer coolly walked on stage wearing shades and proceeded to display his trademark powerful vocals. From the get-go, Burdon’s set took interesting twists and turns. Sure, there were the Animals classics like, “It’s My Life” and War’s “Spill the Wine,” but how about a reggae version of The Animals’ 1965 classic, “Don’t Let Me Be Misunderstood” ? The song morphed into a new track from Til Your Water Runs Dry , “River Is Rising”. The breakout track from Burdon’s new album, “Water” proved to be just as powerful live as it is on the recording. Of course, no Eric Burdon concert would be complete without “House of the Rising Sun”, though this was not saved for the encore. Following the concert, I was fortunate enough to have Eric answer a few questions. Read on! Your roots are in old R&B, old rock ‘n’ roll and the blues. Can you tell me how the blues spoke to you as a young man and how it still speaks to you today? I know you do a tribute to Bo on your latest album, Til Your Water Runs Dry with a song of your own, “Bo Diddley Special” and a song of his, “Before You Accuse Me”. Not to mention, you did “The Story of Bo Diddley” on the first, self-titled album by The Animals. How did Bo Diddley influence you? Bo Diddley had a wonderful sense of humor about himself. Even his name shows that. He also had a completely unique sense of style and rhythm. In fact, the ‘Bo Diddley beat’ will live on as long as there’s rock ‘n’ roll and blues music. The blues in general spoke to me, and still does, because it’s rooted in the spiritual overcoming of oppression, to create something beautiful and honest from the darkest despair. It’s about rising above the pain. Bo Diddley is one of my heroes whom I fantasized about meeting my whole life. We sent messages to each other, through songs and through mutual friends and people we worked with, but we never met face to face until my wife and I attended his funeral, where his family welcomed me like a son. “Bo Diddley Special” was written as a result of that experience in Clearwater, Florida. You seem to be everywhere these days. Your latest album came out earlier this year, you tour consistently with a tour happening this fall and recorded an E.P. with The Greenhornes recently. Not to mention you sound just as fierce as ever on “Old Habits Die Hard”. What keeps you going? Thank you for your kind words. A man has to pay his bills. If I had the choice of staying home, reading books, watching films, going for walks and writing, I would not be out on the road all the time. This is the life of a blues musician. But I’ve reached a point in my life where I am pretty satisfied with what I’ve accomplished, happily married and still doing the work I love to do, so no real complaints. You paid your dues from the moment you joined The Alan Price Combo/The Animals playing clubs all over Newcastle and beyond. What do you make of instant celebrity with shows like X Factor, American Idol? Also, what do you hope for people to get out of your current live shows? First, I didn’t join the Alan Price Combo. When I started a band, it was the Animals. That name has been through many incarnations but I’ve always been the singer. All others are imitations. Instant celebrity results in instant dismissal. When we hit, we hit fast, but it’s been a long, slow road overall. The kids who hit it too fast today may be gone tomorrow. I wish them all the luck they’re going to need, navigating the music industry. I hope people leave my shows satisfied, from the music, the journey through the past to the present…and that they’ll come back. How do you relate “the hippies and the poets and the Spartans” to the song, “Memorial Day”? “Memorial Day” is meant to say that, in addition to the soldiers we’ve lost along the way, we should remember the peacemakers, the protesters, the others who gave their lives for peace. I read that “River Is Raising” was inspired by Fats Domino during Hurricane Katrina in New Orleans. You also recorded parts of Till Your River Runs Dry in New Orleans, and of course you famously sang, “There is a house in New Orleans they call the Rising Sun”. What kind of affinity do you share with New Orleans? New Orleans is the city where it all began. The birthplace of jazz and the greatest expression I’ve ever witnessed. Fats Domino was the embodiment of the disaster that took hold of the city, when he was missing and presumed dead. I’ve always loved the place and the man, and his resurrection is symbolic of what I hope for the place, where so many of the world’s finest musicians are. I played with members of his band when I made the record because they could put into notes and rhythms the history of a place that we owe so much of our history to. You were friends with one of the most famous musicians who have died at the age of 27. Can you tell me about your thoughts of “27 Forever” and the last time you saw Jimi Hendrix? Didn’t he perform with you the night before he died? It is true, he performed with me and War the night he died at Ronnie Scott’s Jazz Club in London. I’ve spoken many times about Jimi but the memory is still painful. He was a complicated man, a genius and a friend. I still miss him and wish we could hear what he would be doing today. “27 Forever” is a song I wrote for all the young, talented musicians that died at the age of 27; Jimi; Janis Joplin; Jim Morrison; Kurt Cobain and most recently, Amy Winehouse, whom I adored. “27 Forever” is a message to all young people to get through it. Life goes on, but you have to survive those difficult years. In “It’s In the Ground” and on the intro to the aforementioned, “Bo Diddley Special”, it sounds like you’re almost preaching on them. Did you approach singing “The Devil & Jesus” almost as a preacher? The difference between me and a preacher is I accept the fact that we all have the Devil and Jesus within us. It’s called human nature. It’s just a matter of which side of our psyche we allow to rule us a majority of the time. Speaking of interpreting songs, you’ve written songs as far back as “For Miss Caulker” on the Animal Tracks album yet, you made “Don’t Let Me Be Misunderstood,” “Don’t Bring Me Down” and “We Gotta Get Out Of This Place” were all written by Brill Building songwriters. How did you approach singing those songs as opposed to singing songs by classic blues artists? I knew “Don’t Let Me Be Misunderstood” as a Nina Simone song. “Don’t Bring Me Down” is still one of my favorites and “We Gotta Get Out of this Place” is one of the most durable songs I’ve ever sung. All of those songs merit being sung and tell a part of the story. I still sing Ray Charles and songs by blues artists, as well. Don’t forget that Ray Charles sang all kinds of songs, from gospel to country and he made them his own. I’d like to think that whatever the source of a great song, I can make it mine. Why is the UK single version of “We Gotta Get Out of This Place” different than the U.S. version? Which one do you prefer? Is there a difference? It’s been so long, I’d have to listen again. I played a show a number of years back in Pioneertown/Joshua Tree with producer/performer, Daniel Lanois. You came up on stage to sing, “House Of the Rising Sun” with us. How did you end up living there? I always loved the desert as an escape from life in L.A. The peace and serenity of the place has always spoken to me. Could you tell me how you ended up singing with War for that matter? I was living in L.A., looking for a new sound, when I met a group of interracial musicians in Long Beach in need of a singer and we declared War. Finally, could you solve this long-standing mystery for me? Is it true Frank Zappa arranged and played on “All Night Long” and “The Other Side Of Life” on the Animalism album? Yes, it is true. Frank was one of the first people I met when I moved to Laurel Canyon. The Animals: the Mickie Most Years and More is due out November 26th on Real Gone Records.